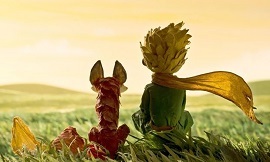 Adapted from the beloved 1943 novel by Antoine de Saint-Exupery, The Little Prince is a captivating and imaginative adventure that continues the recent extraordinary run of profound animated movies with strong cross-generational appeal. 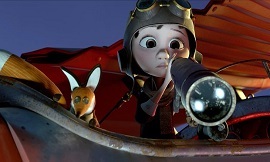 Directed by Kung Fu Panda's Mark Osborne and with an all-star voice cast including Jeff Bridges, Paul Rudd, Rachel McAdams, Marion Cotillard and James Franco, it's the heartfelt story of a young girl who defies her conformist mother and the stultifying environment in which she lives by taking solace in a local aviator's extraordinary tales of imagination. Central to his stories is the presence of the eponymous Little Prince, a magical figure who embodies all the sense of childhood whimsy and wonderment that seems to vanish once the inevitable march into adulthood begins. Amazingly the movie didn't even secure a theatrical release in the USA (it was instead snapped up as a Netflix exclusive), a crying shame given its gorgeous animation (a mixture of CGI and achingly lovely stop-motion) and score from Hans Zimmer and Richard Harvey. With the former having been bogged down in bloated superhero murk for far too long now, it's a genuine breath of fresh air to see Zimmer finally stretching his musical wings once again and fashioning something with genuine heart to it. No doubt the presence of his regular conductor Harvey (who worked on the likes of The Da Vinci Code and Interstellar) helped embellish the soundtrack with an added sprinkling of magic. (As usual, there is a roll-call of 'additional music' credits featuring Clement Ducol, Ed Buller, Dominic Lewis, Nathan Stornetta, Czarina Russell and Benjamin Wallfisch.) The exact nature of Zimmer and Harvey's collaboration isn't exactly clear (Zimmer was signed on to score the movie solo back in 2014) but the sparkling end result more than speaks for itself. The score begins with the first of several pieces featuring the haunting tones of noted French vocalist Camille; titled 'Preparation', it lays the groundwork for the score as a whole with featherweight glockenspiel, John Lenehan's piano, choir and woodwinds establishing an air of whimsy and magic. Camille's voice is established further in the song 'Suis-Moi' (reprised later on), a quintessentially Gallic charmer in which the tender orchestrations weave around her delicate intonations quite wonderfully. In fact much of the album's early section proceeds in this lighthearted vein, the music skipping along in tracks 'The Life Plan', 'Driving', 'Equation' and 'Le Tour de France en Diligence' (both sung Camille pieces, the former co-composed by Clement Ducol), 'The Interview' and 'Plan B'. These are largely short and mischievous-sounding pieces in which Nick Glennie-Smith's obvious light touch as conductor (not to mention Harvey and Bill Connor's orchestrations) helps temper the bombast for which Zimmer is infamous. Charming as it is, one can't help but crave the presence of a theme to ground everything in something more dramatically resonant. Thankfully the first strains of one soon begin to emerge; following the trilling woodwinds and plucked strings (performed by Harvey) heard in 'Get On With It', the next track 'Among the Coins' sees a quite gorgeous theme of burgeoning wonderment emerge from beneath hesitant piano chords and breathy strains of Camille's voice (cleverly utilising plosive effects to lend a distinctive air to the score). With the strings and Lenehan's piano carrying the bulk of the melody, it's surely the most atypical yet appealing construct from the Zimmer stable in quite some time. After another interlude of longing in 'Top Floor Please', one teasing out the theme briefly, the piece than receives its most rapturous statement so far in 'Ascending', building layer upon layer of emotion from vocalist Camille to vaguely Middle-Eastern-sounding woodwind effects (in-keeping with the geography of the Little Prince's story) to choirboy Gabriel Kuti's etheral accompaniment. 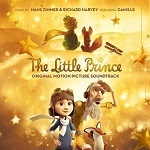 It's stunning music not unlike what Alexandre Desplat has often conjured for films of this ilk, expanded on in the heavenly 'Draw Me a Sheep' (whose soaring choir and recorder solos from Harvey are spine-tingling), 'Stars' (whose undulating Lenehan piano work is captivating) and the accordion-infused 'The Fox'. More Desplat mannerisms come in 'Parachutes', rhythmic arpeggios of strings swirling beneath comical-sounding tuba and tambourine. 'The Absurd Waltz' is even better, a hypnotically arranged and brilliantly orchestrated four-minute slice of magic that augments its offbeat three-step movement with a host of woodwind, piano and string effects in a manner that is quite dazzling; there's a level of complexity laced with delicacy that overshadows anything in Zimmer's recent canon (although one of course has to question how much his additional composers put their oar in). 'The Journey' is simimarly brilliant, hooting brass work lending an air of quirky magic before 'Recovery' pushes the music into more conventionally adventurous territory, surging brass figures this time emphasised with the ever-present piano rippling beneath. The emotional impact of the score's final five tracks is quite something, beginning with the steady build to wonderment in 'Trapped Star', pensive strings and choir ultimately leading to the tear-jerking 'Farewell', a thematic statement of profound beauty and elegance. 'Escape' is a standout piece, utilising fragments of the earlier 'Equation' and allowing the music to really soar on the back of the string and woodwind section; when embellished with a host of snare drums, bells and Camille's voice, it's hard not to think of James Horner's work in this area. 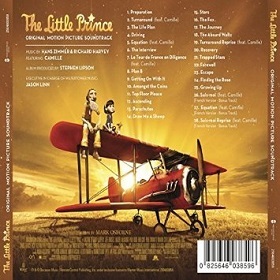 Even so it's the cathartic punch of 'Finding the Rose' and 'Growing Up' at the end of the album that seals the deal, an emotional rollercoaster of melancholy and hope that is staggeringly lovely, so much so that one laments Zimmer's recent absence from this area of film music; truthfully he's far better at this sort of unashamedly heartfelt material than the blockbuster noise for which he's more famous. Indeed it's been hard to praise Zimmer's work in recent years on the likes of Batman v Superman and other tentpole movies; in all honesty his voice has threatened to slip into self-parody. 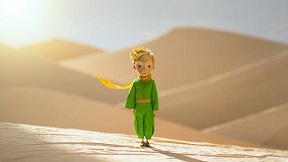 The Little Prince is the sort of unexpected delight that demonstrates he can still compose intelligently constructed, melodic music that augments and complements its respective movie in a manner that's sensitive and impeccably judged. Zimmer has of course excelled in this area before (As Good As It Gets; The Holiday et al) and it's a joy to hear him return to such material. Credit must also go to Richard Harvey whose extensive experience at working with live musicians as a conductor has clearly translated into a nuanced and enchanting soundscape. Of course as with any Zimmer score, one potentially has to judge it as a collaborative effort in which the score's overall success is in large part down to a team of highly skilled people embellishing Zimmer's ideas. Whilst that approach remains hugely controversial (not undeservedly), in this case the glorious end result justifies the means. 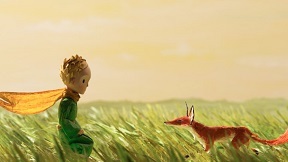 Mysterious and magical, The Little Prince is one of the year's true highlights. The album is available in CD format or for download at Amazon.co.uk and Amazon.com.